the classic desktop PC it is not necessary this will disable the password query, when resuming from sleep mode! Please start the Windows Registry Editor (Windows-Logo+R or Windows-Logo+X). Here is the sub key Personalization. If he does not already exist, click with the right mouse button in the right half and select the context menu New / Key. Then tap Personalization for the name of the key. Rename the new created entry gets NoLockScreen. (Image-1) Disable the lock screen in Windows 10 when resume from sleep! Windows-10 - FAQ-159: Disable the lock screen in Windows 10, how to? Windows 10, turn off password when resume from sleep? Windows 10 how to disable password login after sleep? Windows 10 disable require password on wakeup greyed out? Remove password windows 10, how to disable off password protection for windows 10? Windows 10 power saver mode password protected? How do i take the password off my windows 10 computer for sleep? Booting into windows 10 from sleep without password? Disable password sleep mode in Windows 10? How to remove windows 10 password from sleep, restore from sleep windows 10? Prevent windows 10 asking for password after sleep? 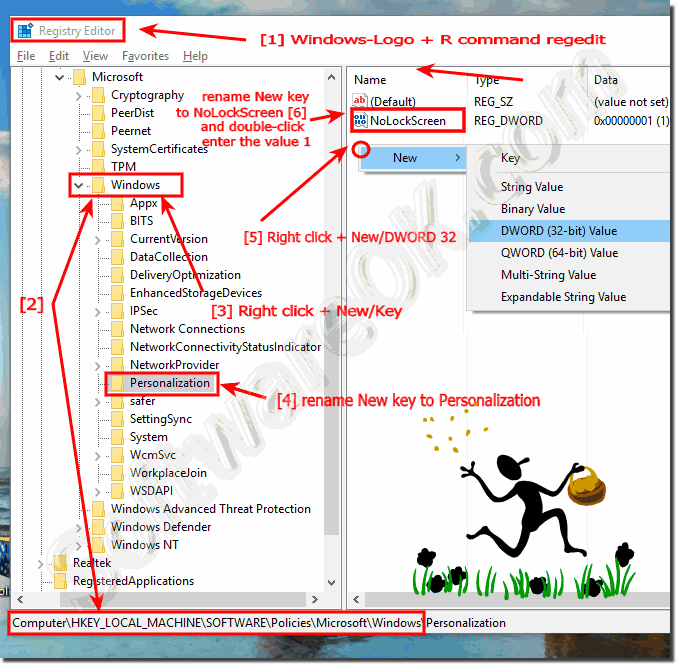 How to disable password on win 10 wake up, how to remove require a password on windows 10? Windows 10 no password after sleep? Bypass password after windows 10 sleeps? Windows 10 password protect on hibernation mode? Windows 10 set to not need password after sleep? Windows 10 remove password check after suspend? Windows 10 remove password after sleep? How to remove password on win 10 resume? How to remove sleep mode password in windows 10, disable password on win8? Windows 10 password protection on wakeup grayed out? Remove windows 10 standby password? How to disable password windows 10 sleep? How to turn off resuming from sleep password on windows 10? Windows 10 return from sleep password? Windows 10 password protection, turn off password when comes out of sleep windows 10? Windows 10 remove sleep password, windows 10 power options wakeup password? How to remove password windows 10 sleep mode? Windows 10 password standby remove? How to get rid of password on windows 10 during wake? Whens computer is in sleep mode on windows 10 how do you get it back on? Windows 10 password when computer goes to sleep? How do i turn off my password on wake for windows 10? Remove the password prompt after standby windows 10? How to get rid of need for password on windows 10 waking up? Turn off password after sleep windows 10? Windows 10 disable login screen after sleep, disable password windows 10? Windows 10 skip login screen after sleep? How to eliminate standby password in windows 10? Win 10 disable wakeup password API? Locked out of windows 10 after resuming sleep mode, delete password off windows 19? Windows 10 auto login after sleep? Remove password after resuming from sleep or suspend mode on windows 10? Windows 10 require password from sleep? Tired of putting in my windows 10 password? How to disable windows 10 password wake up? Windows 10 log in it goes to sleep mode and i have to log in again? Windows 10 password resuming from hibernate? Turn off asking password in windows 10 when hibernation? Windows 10 no password sleep? Turn off requiring password in windows 10? Delete password requirement after restart with windows 10? Windows 1ß lock on sleep? Windows 10 screen sleep password? Password after hibernation windows 10, remove sleep password windows 8? How to remove password on sleep restart windows 10, disable password to wake up windows 10? Windows 10 no password after hibernate? Turn off password after hibernate windows 10, windows 10 prevent password sleep? How do i set windows 10 to require password after sleep mode?